FTC Disclosure: I received an e-ARC through NetGalley from the publisher in exchange for my honest review. I check out the audiobook from Overdrive through my local library. For some reason, when I read descriptions of this book, the circus and eerie, magical elements of this book didn't jump out at me. What I remembered about the descriptions was mainly that Simon is a librarian in a small town, living in a crumbling house, who is given a mysterious book. All true, but far less interesting than this book actually is.I missed the parts that would have made me read this much, much sooner - namely, that it alternates between the present-day and the past, with the portions set in the past taking place in a traveling circus that has implications for the main character, his family, and his book. So, Simon is in the present, tracing the history of this book & worrying about his sister who recently returned home after running away with a circus herself. Back in history, we meet the crew of a traveling circus and the young "wild boy" who comes to live and perform with them. This wild boy is trained by the circus's fortune teller, who warns him against the young, enchanting "mermaid" who entertains spectators by holding her breath. Simon tries to make the connections and figure out how his family came to be in this book. In the past, the circus reels from new developments among its members. As Simon pieces together the history of the book & readers figure out how the traveling circus is connected, Simon must figure out how to avert disaster in the present that stems from his family's history. This quirky book sparkles with magic lying beneath the surface. It sneaks up on the reader - I didn't realize I was dealing with a bit of magical realism until it had already ensnared me and had me pondering odd coincidences and warnings of tarot cards on their own terms. The audio narration was excellent, with Ari Flaikos capturing Simon's frustration, bewilderment, and curiosity throughout the novel, even when listening on 1.5 speed. This was just the audiobook to take my mind off finals while walking the dog & I'm glad I finally got around to it. Verdict: Affirmed. I only wish I had gotten to this dark, offbeat family saga sooner. 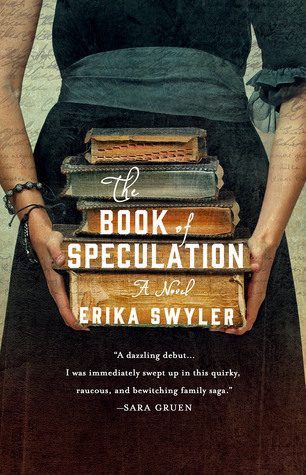 "The Book of Speculation" by Erika Swyler, published June 23, 2015 by St. Martin's Press. Audio narration by Ari Kliakos, published June 23, 2015 by Macmillan Audio.